Overview of Kennicott Valley, facing north. The yellow star marks where I camped. The Root and Kennicott Glaciers create the east and west borders of Donoho peak, and they merge together just south of Donoho Basin. There are a few common sites to camp at in the Basin, and they center around groupings of steel, bear-proof lockers to store food and scented stuff in overnight. These locations are only suggestions though. Backpackers are welcome to stay anywhere the like in areas designated as wilderness within the National Park or Preserve without the chore/safety of requiring a permit. The expectation is that you can look after yourself. 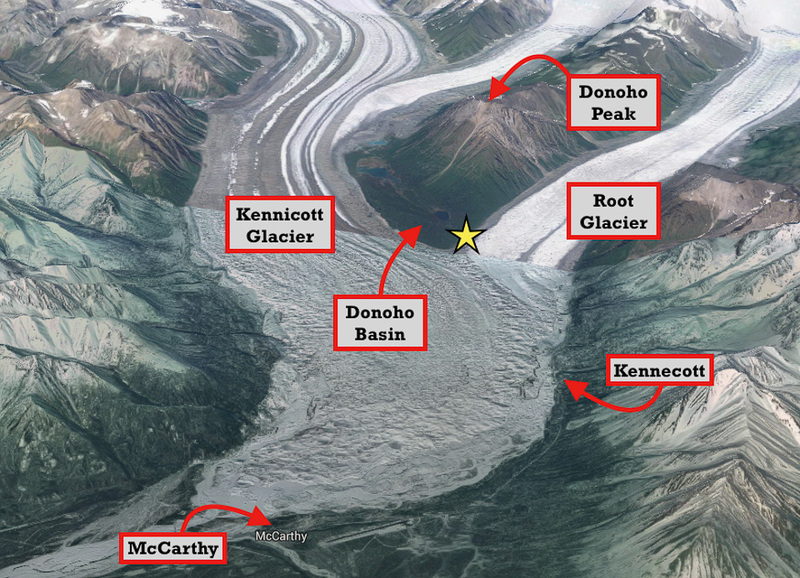 The route to Donoho Basin starts out north from Kennecott and follows the Root Glacier Trail before dipping down onto Root Glacier itself. From there you cut across the toe of Root Glacier and scrambled up its rocky lateral moraine. 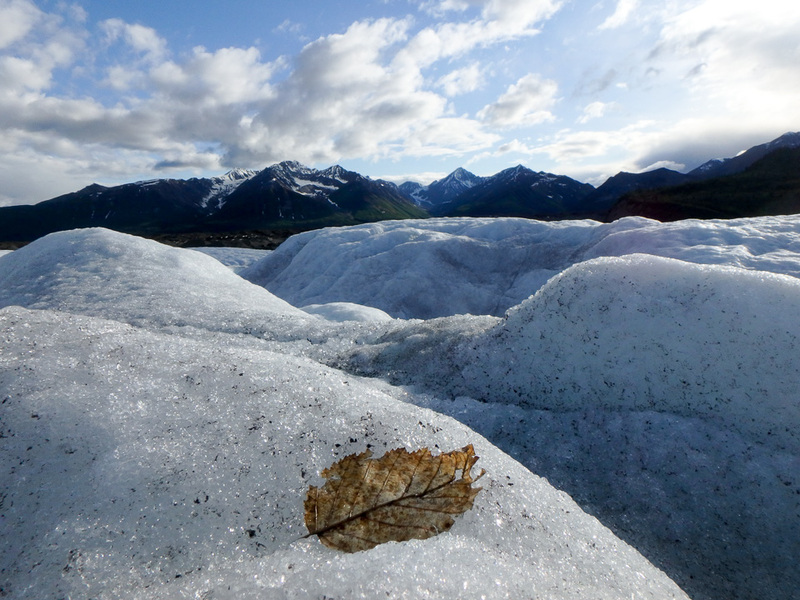 I made camp on the Root Glacier’s western lateral moraine, just below the vegetation line – about 150 feet (45 m) above the ice. 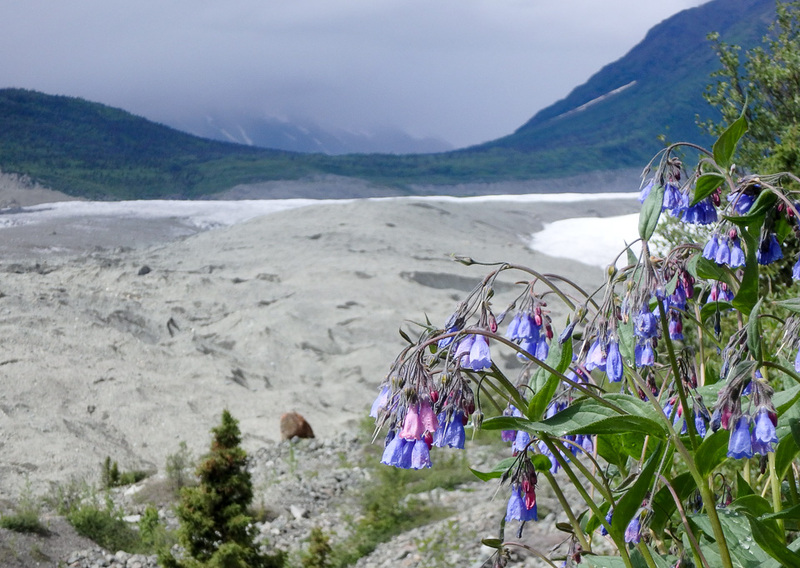 Bluebell wildflowers with Donoho Basin in the background. The surface rocks between the two strips of clean ice form the medial moraine (See: “overview” picture above). Wildflowers are common along the edges of Root Glacier Trail, and even since the last time I was out there, just one week earlier, there are a few new types beginning to bloom. Small birds swing down through the tree corridor created by the trail. Yellow and black butterflies bob upwards from in front of me, and blanch grey moths all but disappear after landing and folding their wings together. At the edge of the glacier I added another shirt layer, and put on my gloves for both their warmth and to protect my hands in case I slip and have to catch myself. By most backpacking standards I started this hike late in the day, and by 6:30 pm I was finally on glacier. It’s light out until late at night so I visibility wasn’t a serious concern, but it does get cold quickly once the katabatic wind (wiki) from the north overtakes the prevailing southern winds from the Gulf of Alaska. It was fun to be glacier hiking with a purpose. Up to that point all my glacier hikes were for their own sightseeing sake. This time the ice was the obstacle instead of the destination. Within a quarter-mile of Donoho Basin the glacier’s frozen waves and parallel fins were scrunched together and choppy. They became harder to navigate, and I found myself backtracking to find the most gradual way around. 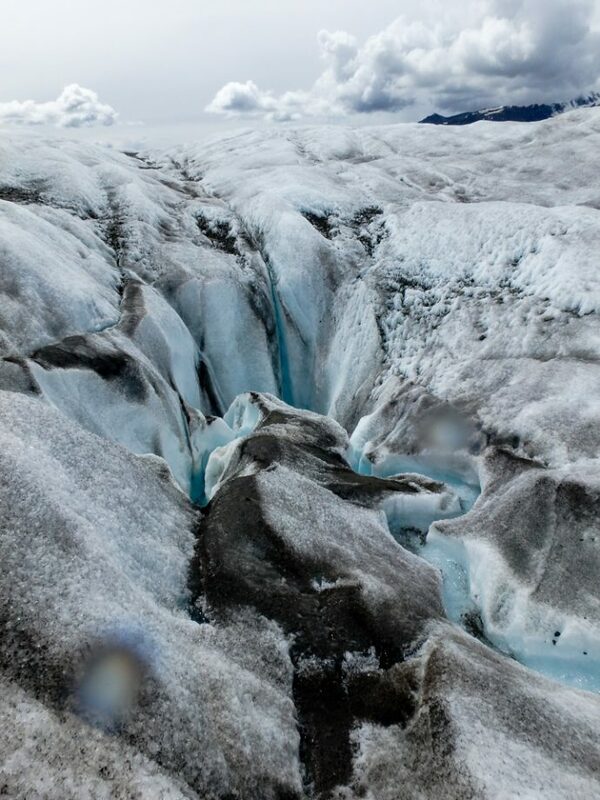 These moulins (wiki) drain surface water down into the glacier through a network of chutes and cracks. As deep as 800 feet (240 m) below the glacier surface, the water bottoms out and flows downstream in rocky-bottomed tunnel waterways . 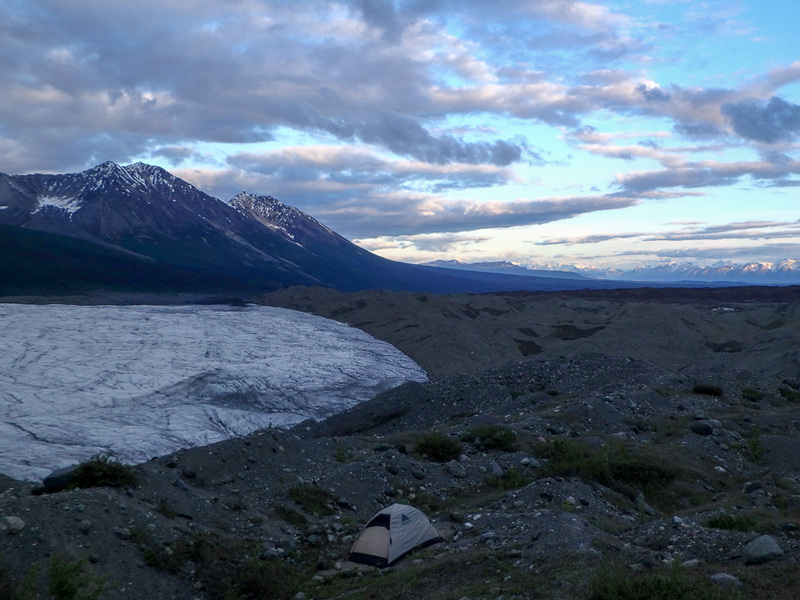 Eventually I was at the far side of the glacier and up the moraine – tent pitched, dinner warmed up, and making conversation with a group of five from Michigan on a three night outing. This is my site. Facing south with the Chugatch mountains at distant right. 11:01 pm. The next morning I picked my further north towards the lower lake in Donoho Basin. It was an overgrown and unmaintained trail, and it gave me a sense of how little experience I have with traveling through dense undergrowth. There are only around 20 miles of maintained trails out of the McCarthy/Kennecott area. 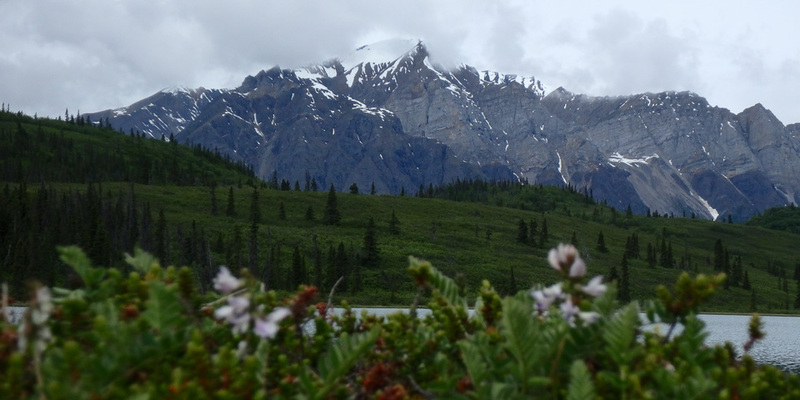 The vast vast majority of Wrangell St. Elias NP is without formal trails. Backpacking trips almost always involve navigating cross-country with nothing more than wild game trails to squeeze through the vegetation. Regarding backpacking in Alaska, I’ve gleaned that bushwhacking tends to be the rule, not the exception. Lower lake in Donoho Basin, Facing east. Kennicott Glacier is beyond those hills and before the mountains. I purified some lake water and watched some sort of black and white ducks float around together. I didn’t cross paths with anyone that morning until I was on the glacier headed home. 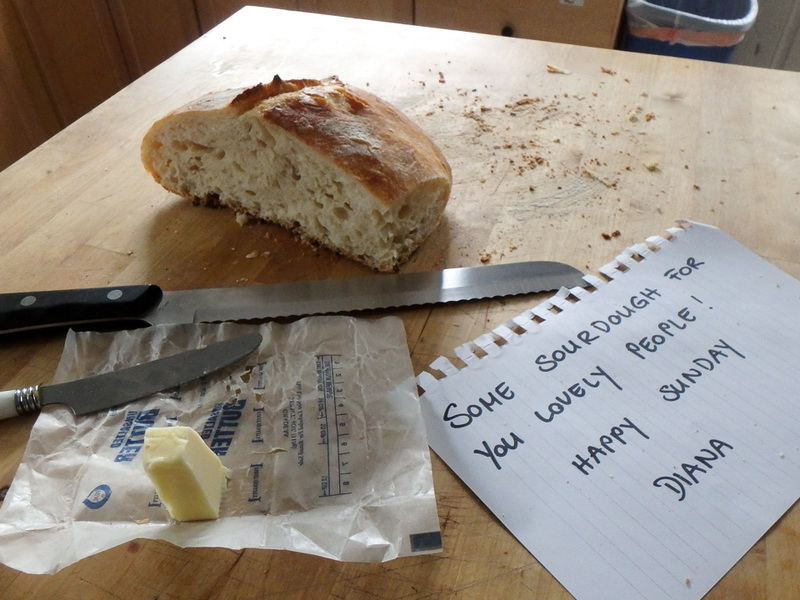 This was an excellent treat to return to after my seven mile hike back. Pictures are really good Jay, what camera are you using?